It is three years since Daniel Harper first lined up on a race grid - three years in which he has soared to become a real rising star of British motorsport. He was only 15 back then and now, having turned 18, Harper is a strong candidate to become the youngest winner of the GB Porsche Carrera Cup series which begins at Brands Hatch this weekend. 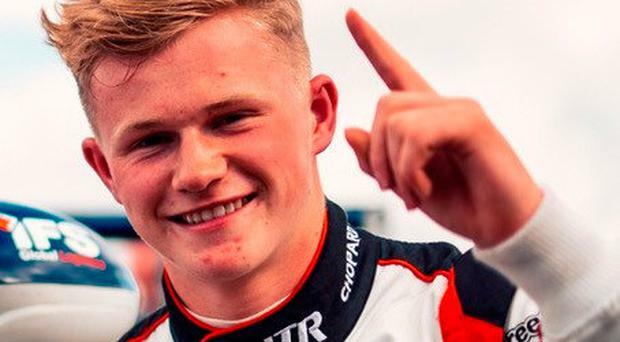 The Hillsborough youngster's talent was recognised early when he was chosen for a scholarship with Ginetta sports cars, going on to record victories in their UK Junior Championship. Then, in 2017, Harper was selected by Porsche for a two-year scholarship worth close to £200,000. He wasn't on their original shortlist, but overtures from his fellow Ulster driver and 2017 Carrera Cup champion Charlie Eastwood, who told Porsche representatives they had to consider him despite his age, led to his inclusion. Eastwood was right. In every aspect of the selection process, Harper came out top, especially on the track. In his rookie season in the Carrera Cup, Harper won twice, was on pole position three times - including at Monza, the Italian Grand Prix circuit - and set seven fastest laps in the JTR team's GT3 Carrera to finish fifth overall in the series. Now, in the build-up to the 2019 championship, Harper has consistently been the fastest driver in all the test sessions at Donington and Brands Hatch where, last season, he was on pole position and set the fastest lap in the final race but didn't make it over the finish line first. It is a matter he wants to put right this weekend when he hopes to get his 2019 challenge off to the best possible start in the opening two rounds, which take place tomorrow and Sunday, in a supporting role to the headlining British Touring Car Championship which features Colin Turkington and Chris Smiley. Buzzing with anticipation, Harper can't wait to get started. "It's amazing to think that it was this week three years ago that this crazy journey all began with my first Ginetta race," said Harper. "It has been a fantastic journey all the way through and now I can't wait for it all to start again. The build-up has been good and the JTR Porsche has felt mega to drive. "Now I have to put the experience I've gained from last season to the best possible use and get off to a good start this weekend." Qualifying is at lunchtime tomorrow with the touring cars later in the afternoon. The Porsches will race on Sunday morning and again in the afternoon, sandwiched between the three BTCC rounds. They will all be covered on ITV4 from 11am. The Brands Hatch programme also includes the Renault UK Clio Cup with another budding Ulster star Jack Young, who has been mentored by Turkington, in the line-up. Young won the International Clio Cup final at Paul Ricard in France back in November and has been fastest in pre-season testing. By Sammy Hamill Craig Breen did what Craig Breen does; got the nose of his Ford Fiesta in front and kept it there through two days to win the Easter Stages Rally, his third victory in a row in the Irish Tarmac Championship. By Sammy Hamill It was business as usual for Craig Breen as he led the way at the end of the first leg of the Easter Stages Rally last night. By Sammy Hamill There was a time when Easter meant only one thing, the Circuit of Ireland Rally and a marathon weekend on the road.